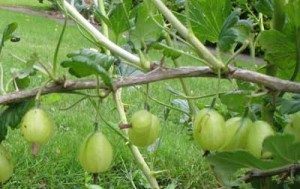 Common gooseberry sawfly (Latin name – Nematus ribesii) is the most common pest of gooseberries. 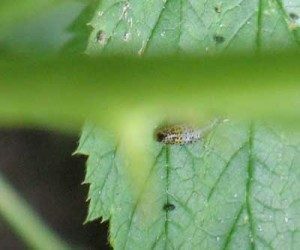 The larvae of the gooseberry sawfly strip the leaves of gooseberry and red & white currant bushes anytime between May and September. The pale green caterpillar-like larvae are about 2cm long, with black spots and black heads. The female gooseberry sawfly lay eggs on the underside of leaves low down in the centre of the bush, so the young larvae are not noticed until they have eaten their way to the edge of the bush. 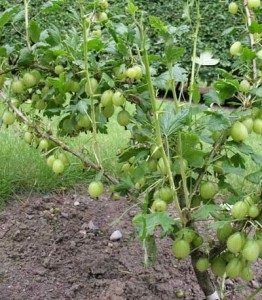 The affected plants have hardly any leaves left, become weak, and are not able to produce a good crop of fruit in the following year. It is important to inspect bushes regularly from mid-April, to look for the sawfly larvae. If they are seen pick them off by hand. Suitable insecticides can be used on the young larvae. Always read the label and follow the manufacturer’s instructions. Common gooseberry sawfly can appear any time during the summer, so keep an eye out!